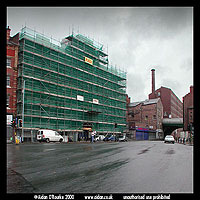 THE PLAZA CINEMA, Mersey Square, Stockport is in September 2000 under renovation.The facade is covered in scaffolding to enable cleaning of the exterior. Just to the right, beyond the bridge carrying Wellington Road South, is the old mill building which houses the Stockport Hat Museum. 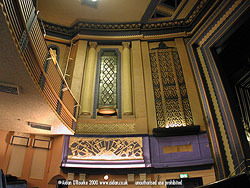 The Plaza Cinema was opened on the 8th of October 1932, and was one of the most luxurious cinemas in the north of England. There was an identical cinema in Altrincham, named the Regal, which burned down in 1956. The Plaza was closed as a cinema on 31 December 1966 and continued in use as a bingo hall until 1998. There were proposals to turn it into a pub or a mega-disco, but after a campaign by local residents, Stockport Metropolitan Borough Council bought it, contributed money for renovation, and handed it to a trust, who are refurbishing the building. 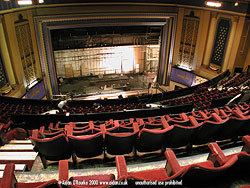 The Plaza will re-open for live shows and cinema screenings in the autumn of 2000, and there is a possibility it will be taken over by the National Trust. Watch this space! 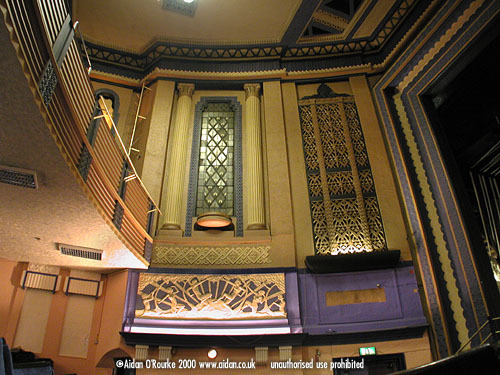 THE PLAZA CINEMA is one of the best surviving art deco cinemas in the UK. Here we are at the very top of the circle, looking down towards the stage, which seems a very long way away. The Plaza was built into a hillside overlooking Mersey Square - behind the white rear wall is solid rock.When the cinema opened in October 1932 it had 1870 seats and a staff of 64 people. On reopening in Autumn 2000, it will have 900 seats. 300 more will be added later. The seats we see here are from the Palace Theatre, Manchester, which recently underwent interior reburbishment. I'm sure I can remember coming here as a child and being scared by the steepness of the upper balcony. I think I can also remember the organ rising up out of the stage. WE ARE INSIDE THE STOCKPORT PLAZA CINEMA, standing in the middle of the stalls and looking up at the interior wall to the left of the stage. Behind the grille on the right are the pipes, bells and other all-acoustic devices of the 70 year old organ. The window on the left, flanked by a pair of columns, has coloured lights which illuminate it from behind. The Art Deco style decor is inspired by the tomb of Tutankamun, which was discovered in the 1920s and had a huge influence the buildings, jewellery and art of the day. At the time it opened, everything in this new cinema exuded luxury, right down to the deep pile carpets (since replaced). In grimy1930's Stockport, it must have been a magical experience to come into a picture palace like this, a temple to the movies, and a place to escape the grim reality of the Depression. 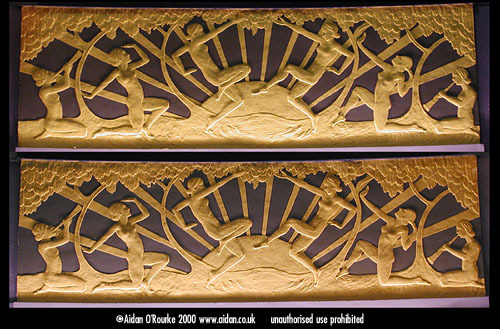 THE MATCHING ART DECO friezes inside the Stockport Plaza cinema are seen here. The upper one is on the right of the stage, the lower one on the left, though both appear to be identical. 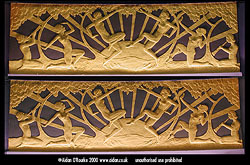 The friezes remain intact after nearly 70 years, though musical instrument wall decorations just next to them were unfortunately lost. The sunrise, leafy trees and silhouetted nymphettes are a typical Art Deco theme of the 1920's and 30's. What a contrast with the smoky, Lowryeque landscape of 1930's Stockport outside.. Thank goodness the Stockport Plaza cinema has been saved for posterity. That's all I managed to see during Heritage Open Days this year - It's a shame they only happen on just two days - I wish it could be Heritage Open Days every day of the year!